There are sometimes circumstances (ahem, ServiceDesk) which require that we open a published Workflow file. By deleting or otherwise adjusting the “project.deployed” file name that sits in the published project directory, we are able to “unlock” that project for editing in the Workflow designer. However, once that project is again published, errors arise that source back to the web.config file. This is because the web.config content is being improperly built upon publish. 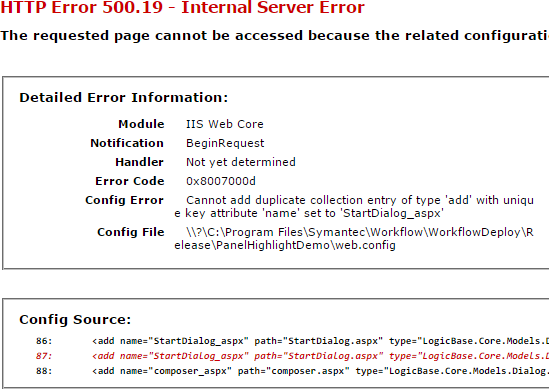 The duplicate “add name” entry for the StartDialog.aspx path is causing the form not to load. 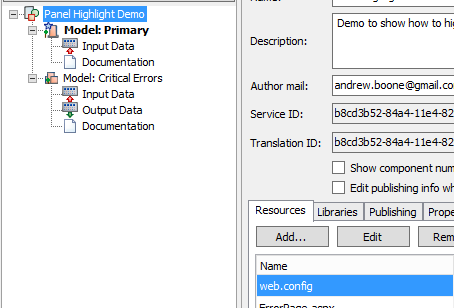 In order to repair this, locate the web.config file in the Projects directory (either by browsing to the directory on the designer server, or by clicking the top-level object in the project tree in the workflow project, shown below). and save the file. Remember that this is the web.config file in the Projects directory, not the Deployed directory. Republish the project and try again. The form should now load properly (assuming no other errors exist).